A new study by a team of Harvard physicists found that a lack of oxygen appears to be strongly related to the pseudogap phase in copper-based superconductors, possibly providing researchers with new insight that may aid in the future design materials of superconductors at higher temperatures. More than two decades after scientists discovered a new type of copper-based high-temperature superconductor — energy-efficient material that can carry electricity without waste — Harvard physicists say they have unlocked the chemical secret that controls its “fool’s gold” phase, which mimics, but doesn’t have all the advantageous properties of, superconductivity. In an effort to better understand the phase, called the “pseudogap,” Associate Professor of Physics Jenny Hoffman and Ilija Zeljkovic, a graduate student working in Hoffman’s lab, began studying where oxygen atoms — a critical element added (“doped”) to a copper-based ceramic to create the superconducting material —are located in the material’s crystal structure. As reported July 20 in Science, their surprising finding is that it isn’t oxygen, but a lack of it, that appears to be most strongly related to the pseudogap. The finding, Hoffman said, should give researchers the understanding to begin designing materials to act as superconductors at even higher temperatures. Discovered in 1988, the copper-based material Bi2Sr2CaCu2O8+x (called “bisco” by researchers) may be one of the keys to creating higher-temperature superconductors. A flaky, black material, bisco is capable of acting as a superconductor, but that useful property is accompanied by several frustrating problems, Hoffman said. For example, bisco is not ductile, it works poorly in magnetic fields, and current flows well through the material only in certain directions. For a decade and a half, Hoffman said, much of that work has been focused on the pseudogap, an unusual rearrangement of the electron energy levels in the material that can mimic superconductivity, which has divided researchers. Earlier studies hinted at a link between the oxygen dopants and the pseudogap, but the results were far from definitive, Hoffman said, because researchers had only been able to image about one-third of the oxygen dopants in the material. 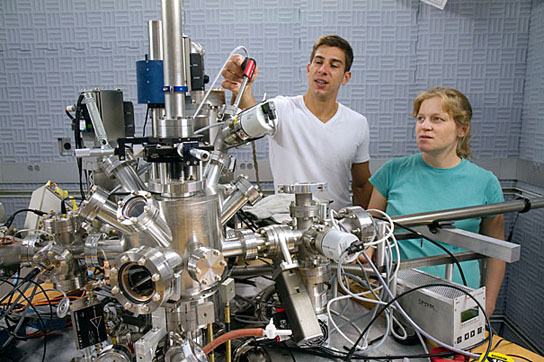 To get a fuller picture, she and Zeljkovic were able to turn up the energy range on a piece of equipment designed to capture atomic-scale images of the material: a scanning tunneling microscope. The microscope, built by Zeljkovic and two other graduate students, Liz Main and Adam Pivonka, works by positioning its needle-like tip several angstroms from a sample. By measuring the electrical current that flows between the tip and the sample, researchers are able to image individual atoms in the material. Using the device, however, comes with significant technical challenges. By slowly sweeping the microscope tip over a 35-nanometer-square area over six hours, Hoffman and Zeljkovic were able to create a map of every oxygen dopant in the top three atomic layers of the material. When that map was compared with data that showed the local strength of the pseudogap, they found a surprise. 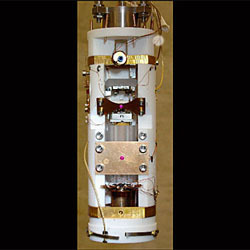 Rather than being correlated with any of the interstitial oxygen atoms — those dopants intentionally added to the metal to give it superconducting properties — the pseudogap seemed to be connected with defects in the material caused by removing oxygen atoms from positions immediately adjacent to copper atoms. Hoffman and Zeljkovic are also working to understand what causes the pseudogap in the first place. They recently invented an algorithm to increase the effective spatial resolution of the same microscope to the picometer level — one-trillionth of a meter. Their new resolution allows them to rule out one possible cause of the pseudogap: a minute structural distortion that breaks the inversion symmetry of the crystal. This work was also reported this month, in Nature Materials. Be the first to comment on "New Insight on Pseudogap May Aid in Future Superconductor Technology"